LPN careers that take you places. Explore more possibilities than you ever imagined and travel with Aureus Medical Group® as a travel LPN. Work in top hospitals and medical facilities across the country and live the life of a local while you’re there! What better way to experience new places than in a healthcare career that takes you from one great destination to the next. At Aureus, we take care of you. Our Skilled Nursing division works exclusively with LPNs. We know your field and how to best present you for opportunities that fit your goals and aspirations. 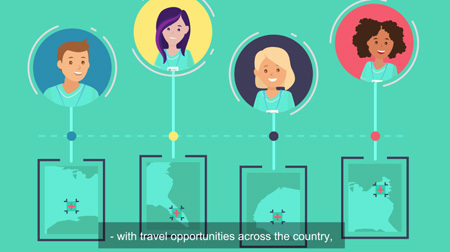 You’ll work with an recruiter who is dedicated to you before, during, and after your travel assignments. And we offer an outstanding benefits package, personal service and 24/7 contact. Want to explore direct hire (full-time) LPN jobs or local contract positions in your immediate area? You have career options! Take the step to begin an exciting and rewarding LPN career with Aureus. We have more than 35 years of experience in healthcare staffing and we'll take you where you want to go!